Having traversed the complexity of the gut, AA absorbed into the portal vein flow to the liver where they may be subjected to further metabolism. The liver is equally metabolically active as the gut, accounting for 25% of whole body oxygen consumption, even though the liver represents only 2% of body weight (Huntington and Reynolds, 1987). 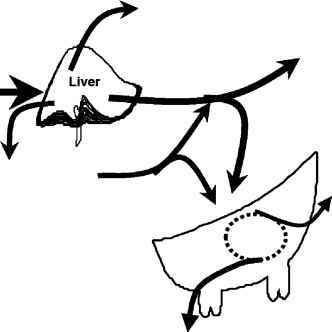 In dairy cows, up to 2000 1 Ir1 of blood passes through the liver (Reynolds et al., 1988). The liver serves a critical role in maintaining AA homeostasis and in the detoxification of large quantities of ammonia absorbed from the gut. There are three options when AA are presented to the liver (Fig. 19.1). First, AA may passage directly through and become available to peripheral tissues. Second, AA may be extracted for synthesis of proteins, constitutive of liver matrix or exported as plasma proteins. Or, third, AA may be oxidized with the nitro gen potentially lost as urea. These three metabolic functions must be coordinated in such a way that the supply of AA to peripheral tissues is adequate, yet AA concentrations in plasma do not rise to toxic levels. The complexity of this process, so vital for maintaining metabolic plasticity, may come at a price that might involve obligatory losses through hepatic oxidation. Fig. 19.1. Summary of studies in lactating dairy cows and goats where the metabolic fates and partition of amino acids were monitored by tracer kinetics in vivo. Data taken from studies in lactating goats (Oddy eta!., 1988; Bequette etal., 1994, 1996a, 1999, 2002; Backwell etal., 1996; Lee etal., 1996; Mabjeesh etal., 2000) and cows (Bequette etal., 1996b; France etal., 1999; Larsen etal., 2000; Reynolds etal., 2000, 2001). Abbreviations: AA, amino acids; Leu, leucine; Lys, lysine; Met, methionine; Phe, phenylalanine; Tyr, tyrosine. cows producing 16.8 kg milk day-1 Blouin et al. (2002) observed that the liver removed 34%. For essential AA, although rates of removal vary from study to study, there are some common features. For example, only a small proportion (0-30%) of absorbed branched-chain AA (leucine, valine and isoleucine) is removed across the liver in non-lactating cows whereas in lactating cows there is a net liver release of these (Table 19.4). 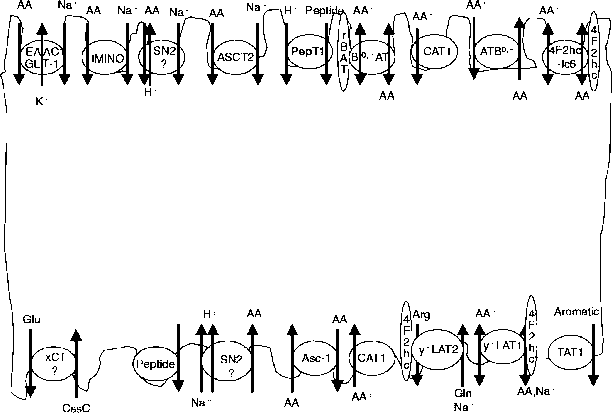 Catabolism of the branched-chain AA occurs in two steps with, in ruminants, transamination occurring mainly in non-hepatic tissues and oxidation of the corresponding keto-acid occurring mainly in the liver (Fig. 19.1). Lobley (1992) suggested that this division of branched-chain AA (particularly leucine) catabolism might allow them to act as signals of nutrient intake and adequacy through coordination of nutrient- and hormone-mediated peripheral tissue protein turnover. In contrast to the branched-chain AA, the liver removes substantial amounts of absorbed histidine, methionine and phenylalanine, both in lactating and non-lactating dairy cows (Table 19.4). Removal of AA by the liver, however, does not equate to oxidation. Synthesis of plasma proteins may reach 155 g day-1 in the dairy cow, representing 10-20% of hepatic removal of phenylalanine (Raggio et ai, 2002). Unfortunately, due to technical constraints, the metabolic fate of the liver export proteins and whether these serve as nutrient vehicles to specific tissues has yet to be determined. It is very likely that they are significant sources of AA for protein synthesis. For example, uptake of plasma proteins by the mammary gland may account for the shortfalls in blood free AA uptake by the gland of histidine and phenylalanine (see below). On average, liver extraction of nonessential AA is higher than for essential AA, and this higher extraction is related to the metabolic functions of some non-essential AA. For example, glutamine and alanine are used by the liver for gluconeogenesis and they act as shuttles of NH3 and amino groups between peripheral tissues and the liver (Bergman and Pell, 1985). Table 19.4. Proportion of net portal absorption of amino acids removed by the liver in non-lactating and lactating dairy cows. aFrom Wray-Cahen etal. (1997), basal periods. bFrom Blouin etal. (2002) and Berthiaume (2000). °Net removal by the liver zero. dData only from Blouin etal. (2002). of essential AA seems to be under tight control because the postliver supply of histidine, methionine, and phenylalanine is nearly equal to their net mammary uptake and secretion into milk protein (Lobley and Lapierre, 2001). Catabolism of these AA is believed to occur mainly in the liver (see Fig. 19.1 for phenylalanine), but the question still remains: Does the liver extract AA in excess of peripheral needs or does the mammary gland use what is left-over by the liver, i.e. is it a 'push' or a 'pull' mechanism? Many questions still need to be answered with regards to AA metabolism across the liver, but one thing is certain, hepatic metabolism differs greatly among AA and it alters both the quantity and the profile of AA delivered to the peripheral tissues, including the mammary gland.